Artist Peter O’Neill is pleased to announce the opening of his fourth signature art gallery on May 18th, 2013. O’Neill Studios, INC is located at 319 Royal St, New Orleans, Louisiana, 70130. Phone: 504-586-1636 in the heart of the world famous French Quarter. 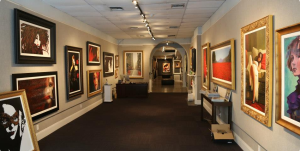 In response to increasing consumer and collector demand for the original oil and mixed media artwork of renowned painter Peter O’Neill, a 2nd New Orleans art gallery featuring Peter’s work is set to celebrate its grand opening on Saturday May 18th 2013. The new O’Neill Studio will provide ample viewing space for crowds of tourists, local residents, and art collectors who frequent the current gallery. There will also be space dedicated for exhibiting the work of other artists who have been hand selected by Peter for the quality and range of their work. This provides these artists a chance to show in a nationally known artists’ gallery and have their work exposed to a growing list of international collectors. Artist Peter O’Neill sprung from a troubled lifestyle and in two short decades has evolved from humble street painter to an internationally acclaimed master of oil on canvas. Although demand for Peter’s commissioned work is high, he is also well known for his philanthropic acts, including donations of thousands of reproductions to various charities and public venues. Peter first gained the national spotlight with his original oil painting “Two Minutes of Silence”, depicting a grieving flag-draped New York firefighter taking a knee within the devastation at Ground Zero. Peter has leveraged his notoriety to raise thousands of dollars to help the New York City Fireman and Emergency Service Relief Fund. Lithographs of this poignant masterpiece were donated and are on display in over 14,000 fire houses and public buildings around the United States. O’Neill Studios, Inc. and O’Neill Gallery operate four art galleries in the United States. They feature the original artwork and reproductions of the artist Peter O’Neill. For more information on the work of artist Peter O’Neill or the new O’Neill Studios gallery visit oneillgallery.com or the Peter O’Neill Facebook page.